Kurunegala High Court Judge Rathnapriya Gurusingha yesterday ordered the prosecution in a case of financial misappropriation against former Minister Jhonston Fernando to hand over their documents and police reports to the defence lawyers before August 1, 2016. Defence Counsel Dhananjaya Samarakon informed the High Court Judge before filing a case, the prosecution must be handover the documents under section 162. In this case, the Attorney General filed indictments against former Co-operative and Internal Trade Minister Jhonston Fernando and two others in the Kurunegala High Court over the alleged misappropriation of Rs. 5.02 million of Lak Sathosa during the N.W.P. Provincial Council Election in September 2013. Fernando along with former Sathosa chairman K.M.R.Fernando and the former minister's private secretary Raj Mohideen Mohomad Sakeer were indicted in the High Court for aiding and abetting to commit this offence. The three were charged under the Public Property Act. They were arrested by the FCID on May 5, 2015. 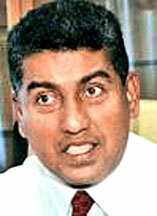 State Counsel Lakmali Wijesinghe appeared for the prosecution and put off the case for August 1. Yes of course. I accept that we can't share everything with a separate family. We need our relaxing and freedom of speech in older days.